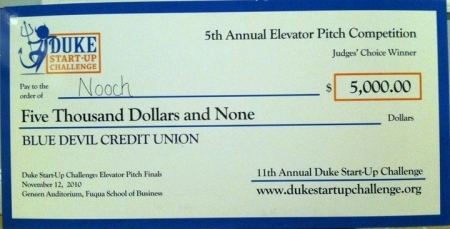 Nooch won Duke’s University Fuqua School of Business Elevator Pitch netting 5,000 US$. Nooch aims to allow anyone to use a smartphone to pay back a friend, settle a bet, or just send a birthday gift in only a few seconds, the startup says. Not there yet though – for the payout of the prize money a paper cheque was needed.